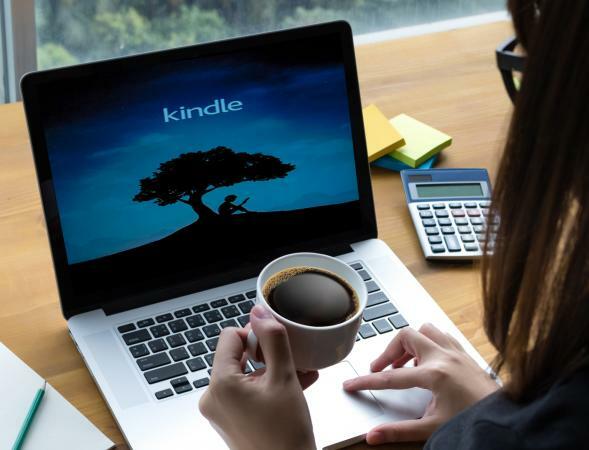 Amazon Kindle is far and away the most popular e-book reading platform today, but this does not necessarily mean that you need an actual Kindle device to read your e-books. You can read them online from just about any web browser, accessing all the e-books you've purchased through the platform. The way that you go about reading Kindle e-books online is through a free, official tool called the Amazon Kindle Cloud Reader. You can do this on your own computer as well as on public terminals like you would find at the local library or internet cafe. Just remember to log out and clear out all cookies when you're done. Open the web browser of choice on your computer. Log into your Amazon account using your email and password. You will be presented with all the Kindle content associated with your account. Choose between a grid-based view or a list view by clicking the corresponding icon near the top-left corner. Sort by recent, author, or title using the pull-down menu next to the grid/list buttons. Click on the title you would like to read. Hover your mouse pointer to the left and right edges of the screen to reveal the page turn buttons. Hover your mouse pointer to the top or bottom of the screen to reveal additional options like search, the "go to" menu, settings, bookmarks, notes, and more. Click on the "Library" button to return to the main screen. Like on physical Kindle devices, Kindle Cloud Reader will save your progress in any book you read. It can then sync your place in the books with your other connected devices. Even though the biggest appeal of Kindle Cloud Reader is the ability to read your Kindle books online through a web browser, it is also possible to download Kindle content for offline reading. This can be useful for reading on your laptop while on a plane that lacks in-flight Internet access, for example. Open Kindle Cloud Reader in your web browser using the instructions above. Click on the "Downloaded" button in the middle near the top of the page. Click the yellow button marked "Enable Offline" in the pop-up window. Enable the corresponding browser extension or plug-in. Return to the Kindle Cloud Reader page. Right-click on the title you would like to download and read offline. Choose "Download & Pin Book" from the resulting list of options. The list of books you have saved for offline reading is accessible through the "Downloaded" tab. The books you've read most recently using Kindle Cloud Reader through that browser on that device will be automatically downloaded too. Older books are automatically deleted as additional space is needed for newer content. If you would prefer not to use your web browser to read your e-books, you can choose to download the Kindle app for your Mac or Windows PC as an alternative. On the same webpage, you will find the links to download the Kindle mobile apps for Apple iOS devices (like the iPhone and iPad) and for Google Android devices. Each installation of the Kindle app for Mac or PC is treated as if it were its own dedicated Kindle device and will show up in your account settings as such. After downloading and installing the desktop app, you will be asked to register your Kindle the first time you open it. Enter the email address and password corresponding to your Amazon account. Functionality is similar to Kindle Cloud Reader, except it is in a dedicated app instead of via a web browser. The convenience and comfort of a dedicated Kindle e-book reader is certainly appealing, but having the option to read books through a web browser on any computer can come in handy. Whether you are at the office or visiting family in another city, you'll always have your Kindle library close at hand.